Rio Olympics, raw sewage: Rowing team ill after competition in lake. An aerial view of Rodrigo de Freitas lake. 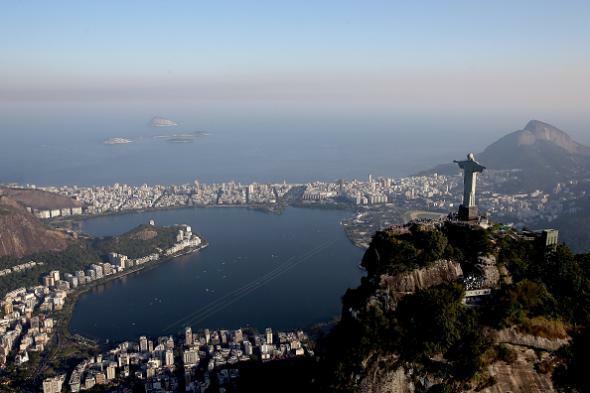 The AP reported in July that water quality at the outdoor sites scheduled to host competitions during next summer’s Rio de Janeiro Olympics was not great. Athletes in next year’s Summer Olympics here will be swimming and boating in waters so contaminated with human feces that they risk becoming violently ill and unable to compete in the games, an Associated Press investigation has found. Thirteen rowers on the 40-member U.S. team came down with stomach illness at the World Junior Rowing Championships — a trial run for next summer’s Olympics — and the team doctor said she suspected it was due to pollution in the lake where the competition took place. Four staff members, including the team’s coach, also fell ill. The (sort of) good news, the AP says, is that the U.S. team was the only international squad at the competition that suffered from unusual levels of sickness. Correction, August 11, 2015: This post originally misstated the number of medals the U.S. and Germany won.